I just bought a 1949 Penn Yan Trailboat. In the process of removing the gunwales, I found that several of the ribs are rotted at the very ends, where the gunwales attach. The rest of the affected ribs are in great shape. Please please remember that rot spores will have progressed 18 inches,[500mill] beyond what you can see. When you fine the end of the rotten rib, that is the amount of timber that you have to remove to be sure of eliminating the problem, unless you are happy to rely on some "wonder drug" for timber which may or may not work. 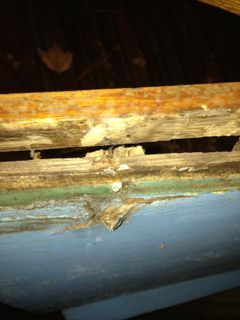 Depending on how far down the rib the rot has travelled it may be possible to add a beam shelf to the top of the ribs. If the rot is two inches max ten you could use a four inch piece of good Douglas around five eighths thick to run the whole length of the boat. Fasten it through every rib from the outside and cut off and treat the rot on every rib. Quicker than sisters and more pleasing to the eye from the inside of the boat. The overall job is very strong. It depends on the shelf being twice the length of the rib you cut off. From the photo it looks like you've already removed enough of the canvas to attach the sister ribs from the outside. You can make them wider as space permits to get the strength you need and extend them far enough alongside the rotted ribs to stabalize them. You can even bridge the weak rib by making a dado in the sister ribs and fasten it along both sides of the original ribs. Some epoxy does wonders if you need to place short fasteners on the inside rather than going in from the outside. Thanks, Gene...How are the sister ribs attached? The planks are very thin and I don't want to go through to the canvas. I'd install sister ribs going far enough down the rotted rib to ensure it was more than a cosmetic repair but to gave the structure stability.